Meishan Pigs are critically endangered world wide. Gods Blessing Farm is excited to be deeply involved in the preservation of Meishan Pigs in North America. Meishan Pigs are part of the Taihu group of Chinese pigs (so named for the lake in that area) . The Chinese have been selectively breeding domestic swine in this region for over 5000 years. 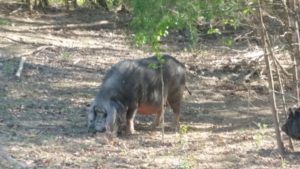 They are quite probably the oldest livestock breed of hog in North America. Taihu pigs are prized in China and Japan for their succulent marbled meat and superior lard and fat quality.It is a medium sized lard carcass hog growing to a maximum size of 250 to 400+ lbs. It is the most docile breed of hog in the world. However today there are shockingly few Meishan Pigs that are verifiably pure worldwide. Research has revealed that in China today the only verifiably pure Meishan Pigs are raised on state conservation farms. And their genetics are tightly controlled.Estimates put the worldwide population of verifiably pure Meishan Pigs at less than 2000 animals. Meishan Pigs were first imported into the US in 1989 after 10 years of negotiations with China. Meishan Pigs were the focus of a joint study between the USDA, Iowa State and the University of Illinois. They were imported to be studied for their hyper productivity. 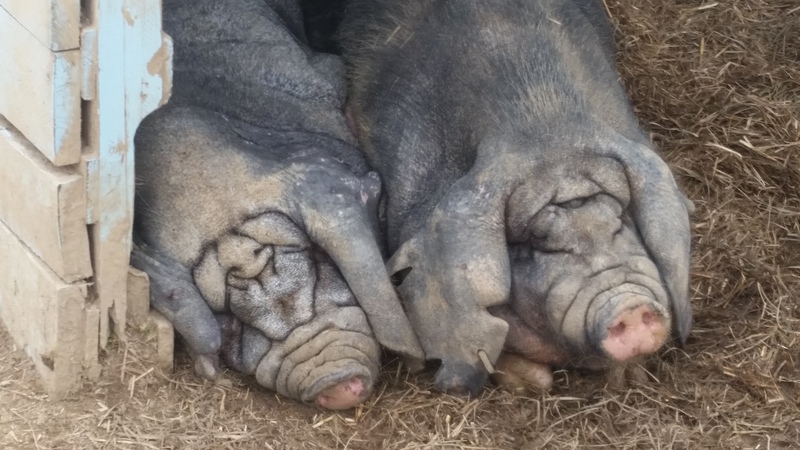 Meishan Pigs are renowned for their large liters(14 + on average by the third farrowing) and superior mothering abilities that result in higher ween to farrowing ratios. Piglets of both sexes enter puberty at approximately 90 days which is significantly faster than domestic hog breeds. Meishan Pigs typically have 16-20 teats allowing them to easily raise such large litters of Meishan Piglets. They are also a very sedentary and docile pig which allowed them to be raised on smaller farms in China. 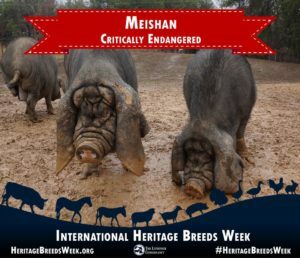 Their temperament also results in minimal environmental impact on pastures and woodlots.Under the agreement between the USDA and China the Meishan Pigs that were imported(and their offspring) were restricted to use in research facilities or zoo’s until the experiments were concluded. These three research herds then spent over 20 years in almost total genetic isolation. None of the research facilities shared genetics. And the three Meishan Pig herds displayed independent levels of genetic drift from the original importation herds and each other. This fact is the basis for the A.M.B.A.’s recognition of three distinct Meishan Pig bloodlines. There is no breed of pig that has been more fully researched and examined by the USDA than the Meishan Pig. Between 2008 and 2010 Iowa State terminated and dispersed their herd.Most of that seed stock has been lost or heavily inbred.Based on our investigations none of the University of Illinois herd or the USDA herd were available to private breeders. Until now that is. In February of 2016 We were able to acquire the remainder of the Meishan pigs in the University of Illinois research herd. In May of 2016 we concluded negotiations with the USMARC facility director to acquire the last Meishan Hogs in their research herd. On May 26th 2016 We picked up the last remaining Meishan Pigs in the USDA herd in Clay Nebraska. NONE of the original research herds remain today. But because of our acquisition these genetics were not lost. The last reservoirs of documented pure Meishan Pig genetics still exist here at Gods Blessing Farm. This has been an incredible find. And the first step in our mission to establish and preserve this breed in the US. 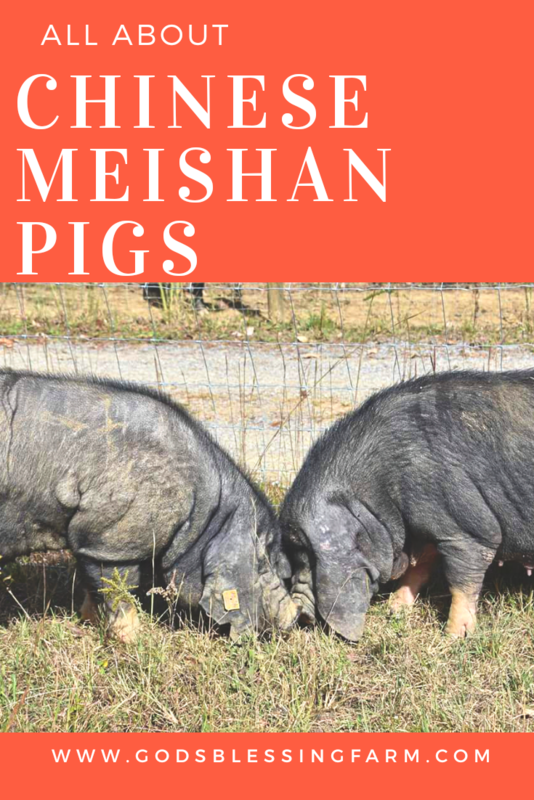 The hogs from these two research herds (USMARC and University of Illinois ) combined with our other Meishan pigs means that Gods Blessing Farm has the most genetically diverse herd of Meishan Pigs outside of China. Gods Blessing Farm and our customers, are the only breeders in the US to have genetics from all three of the original research herds.We even have pedigrees on our USDA stock going back at least 3 generations.In addition we have sufficiently unique lines(both boar and sow) to assure a genetically sustainable population of Meishan Pigs going forward in the US. If you have a Meishan we can provide you with an unrelated breeding partner.If you want a breeding pair we can provide you with the most diverse genetic base to choose from .If you want multiple unrelated breeding pairs we can supply those also. Currently we have seven genetically unique boar lines and four genetically unique sow lines. And we can now supply these unique genetics to breeders who currently own Meishan Pigs or wish to. Harvey Blackburn ,a senior geneticist at USDA, conducted an extensive study (Blackburn et al 2014) on Meishan Pig genetics in the US. Harvey sampled DNA from both the USMARC herd and the Iowa State herd. These samples were compared to the DNA samples from the original Chinese Meishan Pigs that were imported in 1989. Over the 20+ years of genetic isolation the herds in the US had experienced “genetic drift” from their Chinese cousins. In addition they had even become genetically differentiated from each other. That genetic drift had effectively resulted in each research herd becoming a genetically unique sub species,or bloodline, of Meishan Pigs . This “drift” had even resulted in DNA gene pairings,or alleles, that were unique only to the US examples of the breed. Each herd had become genetically differentiated from the original Chinese Meishan Pigs and each other. These were the results. The USDA pigs are genetically closer to the original Chinese Meishan Pigs than the Iowa State herd. The University of Illinois pigs were not sampled it is safe to assume they have “drifted” also. Our observations of the different characteristics of each bloodline(from the respective research herds) confirms this. We have had extensive conversations with several of the co-authors of this study. With the USMARC pigs and the University of Illinois pigs Gods Blessing Farm can now help committed breeders conserve the Meishan breed in North America. 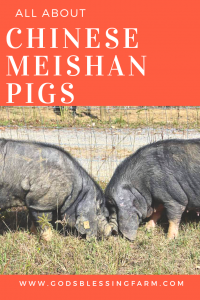 We are currently offering at our breeding schedules for spring 2019. and Gods Blessing Farm will be able to offer pure Meishan Pig genetics to a a variety of breeders with a variety of farm goals.